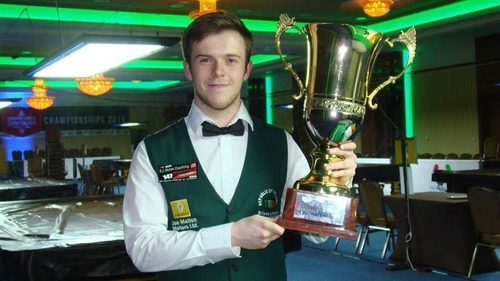 Ireland's Josh Boileau claimed the scalp of world number six Shaun Murphy at the Welsh Open. The 2016 European Under-21 champion won 4-2 in Cardiff and is through to the last 32 where he will meet Robert Milkins. The 21-year-old said: “Just to play Shaun today was a dream come true, and to beat him is something I will always remember. “He inspired me, I started playing after watching him win in 2005. He beat Matthew Stevens in the final and I have played Matthew a few times too. “Now I have beaten Shaun I can’t see why I can’t win a few more matches. I’d like to play all of them – Ronnie, Mark Selby, anyone. Give them to me and we’ll see what happens. "I can’t see why I can’t win a few more matches"
Dubliner Fergal O’Brien beat Chris Wakelin 4-2. Mark Davis staged a stunning comeback to beat four-time winner Ronnie O'Sullivan and reach the quarter-finals. The 44-year-old looked set to be whitewashed when he trailed O'Sullivan 3-0 but a nerveless break of 81 helped him drag the match back level before claiming a 4-3 victory in the decider. Fellow veterans Mark King and Anthony Hamilton have already clinched their first ranking titles this season and Davis said he now sees no reason why he cannot follow their examples. Davis told Eurosport: "I watched Mark and Anthony and they have both been around a long time. "They have managed to hold themselves together and do the business. You've just got to be persistent and keep going, and go out and do it for yourself." On a day of shocks Neil Robertson was beaten 4-3 by Lee Walker while Shaun Murphy, Marco Fu and Liang Wenbo also lost. World champion Mark Selby avoided the same fate but only after twice having to come from behind to overcome Mike Dunn 4-2.